Hello everyone. I hope you had a good New Year's Eve. I'm sad to say goodbye to 2010 but I'm also welcoming the New Year and hope to make it a good one. One of my resolutions for this year is to be vegan once a week. I've always been interested in the vegetarian or vegan diet but have been hesitant to become one myself. I've tried being vegetarian for a week and did not have any trouble doing it. Although I’m afraid about how difficult it would be if I became a vegetarian. More recently I have become interested in a vegan diet as I finding that many health benefits that come with it. I also support the rights of animals, do not enjoy meat or milk that much to begin with, and find sometimes find it unnatural that humans consume these products (particularly that people drink milk intended for other baby animals). So I will see much I fare with being vegan one a day a week and decide if I should change my diet from there. Is anybody else willing to share their New Year resolutions? I need to mention this delicious cake. I made it last year for Christmas dinner again this year. This is saying something as I rarely make the same recipe twice (why should I with all the millions of recipes to try out there?). It’s a Cranberry Upside Down Cake. The cake base is perfectly moist and delicious while the cranberry topping is just a bit sweet as well as being the perfect fruit for Christmas. The recipe needs absolutely no alterations and I urge you to try it if you have some extra cranberries. The cake base recipe can also be used alone or for any type of upside down cake. That cake looks delish! Do you ever make vegan desserts? Happy New Year Kat! 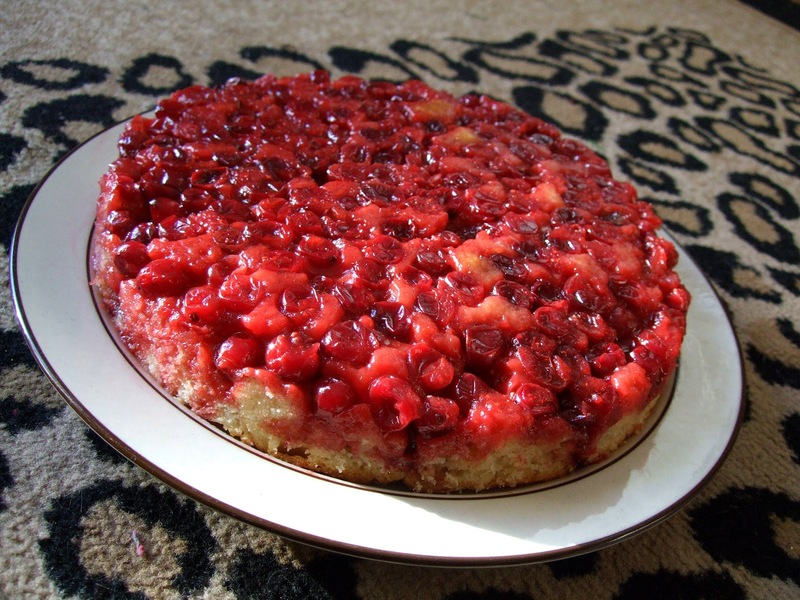 The cake sounds fabulous - I've never thought of cranberry upside-down cake before! Did you use wild (forest) or cultivated cranberries? I'd like to try this someday! Cranberry upside down cake -- delish! Do you like mixing up recipes and trying different flavors/add-ins? @ Alina: I used cultivated cranberries but I bet you could use any as long as they cover the whole pan. @ Kat: I do enjoy mixing up recipes. My almond butter cookies originally used peanut butter! They taste great both ways. What a great seasonal dessert! I've always heard of pineapple upsidedown cake but not cranberry. This would be much better for winter.